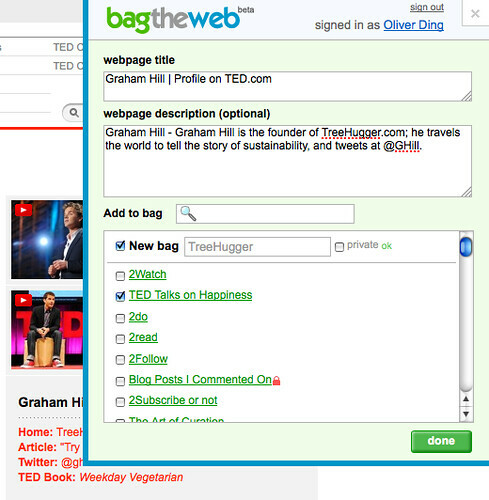 As you may notice we just released several new features on BagTheWeb. We are pleased to introduce them to you and hope you will find them useful. 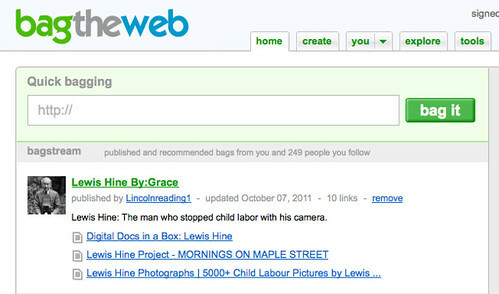 Many users suggested that we add a “multi-bagging” capability to the bookmarklet and we listened. Now it comes! You can add a webpage link to multiple bags at one time through the “bag it” bookmarklet. Now if you sign into our site, you will see a “Quick-bagging” box above the bagstream section where you see upcoming bags from people you follow. Just paste a URL in the Quick-bagging box, click “bag it” button, then a webpage link is already in your bag(s). 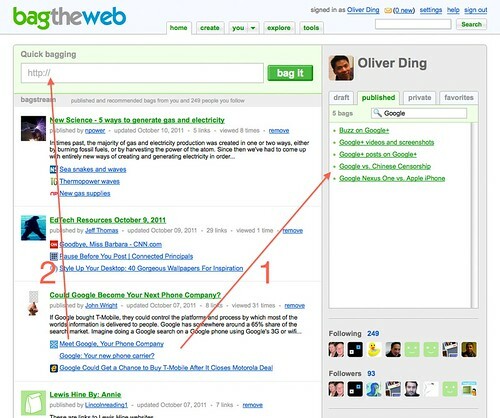 The Quick-bagging box and the Multi-bagging bookmarklet use similar user interfaces. Also, multi-bagging capability is included in the quick-bagging process. We also modified the personal homepage by making the sidebar more useful, providing faster access to your bags and easier exploration of the bagging community. Together, these new features bring us a coordinated performance. We hope you will enjoy the improved bagging experience. You may want to check out the following bags to see screenshots and tips. We are working on more features to improve the core bagging capability. We will appreciate it if you could give us your feedback and advice. You can leave comments on the above bags. This entry was posted in Features and tagged Multi-bagging, Personal Homepage, Quick-bagging by Anjian. Bookmark the permalink.